Switzerland’s long-term air-defense plans are beginning to come into view following the unveiling by the Swiss Department of Defense, Civil Protection and Sport (DDPS) of recommendations by an expert group charged with examining the country’s combat aircraft and air defense requirements. Defense Minister Guy Parmelin set up the expert group in February 2016 in order to determine the best methods for ensuring the protection of Swiss airspace in future years. The formation of the expert group occurred two years after the Swiss electorate voted against funding the procurement of 22 new-generation Gripen E fighters from Sweden as a replacement for the Swiss Air Force’s legacy fleet of F-5E Tigers. The Gripen saga illustrates the political and financial sensitivities for Switzerland in finding long-term replacements for the Air Force’s inventory of 54 F-5E Tigers and 30 Boeing F/A-18 Hornets. The Gripen selection followed a lengthy process that kicked off in January 2008 when the DDPS issued Requests for Proposals to Boeing regarding its F/A-18E/F Super Hornet, France’s Dassault for the Rafale, Airbus Group (formerly EADS) for the Eurofighter Typhoon, and Sweden’s Saab for the JAS 39 Gripen. More than three years later, on November 30, 2011, the Swiss Federal Council announced its selection of the Swedish option, with Defense Minister Ueli Maurer citing price as the deciding factor in the nation’s Tiger Partial Replacement (Tiger Teilersatz, or TTE) competition. The Gripen NG offer was reportedly 25 percent lower than the other two bidders’ offers. The selection itself did not come without controversy: in February 2012, a confidential 2009 report put out by the Swiss Air Force was published in the Zurich-based weekly newspaper SonntagsZeitung claiming that tests conducted in 2008 determined that the Gripen was inferior in performance to the other two competitors. Maurer denied having any knowledge of the report, and the Swiss defense establishment rallied around him, arguing that the Gripen was the best possible selection for the military. Finally, on August 25, 2012, the Swiss government agreed to a deal with Sweden on the joint development, acquisition, and operation of the new‑generation Gripen (Gripen E). But any prospective aircraft selected to replace the Swiss Air Force’s F-5E Tigers was destined to have to meet public approval, as previous Swiss fighter buys had resulted in scandal (the 1964 purchase of Dassault Mirage IIIs resulted in severe cost overruns that forced the Air Force chief, chief of general staff, and defense minister all to resign) and a referendum (on the 1993 purchase of F/A-18 Hornets). In the case of the Gripen buy, Swiss political parties spearheading the “No” campaign – elements from the left side of the political pendulum such as the Social Democratic Party (socialists), Swiss Green Party, and Liberal Green Party, as well as the pacifist Group for a Switzerland Without an Army (GSoA) – were able to rally opposition to the procurement by arguing that the lifetime costs of the aircraft would force the government to shrink expenditures for other vital areas, such as education. 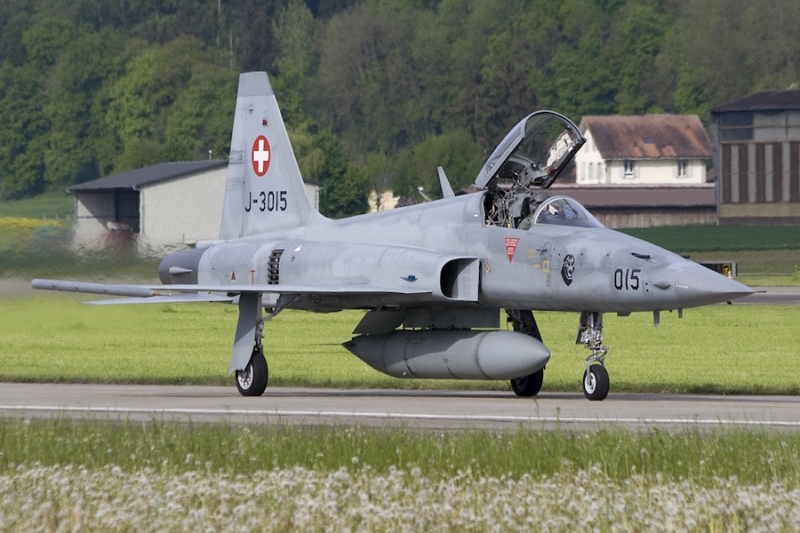 Though the trade group Swissmem claimed that a Gripen buy would bring CHF2 billion in workshare orders to local industry, Defense Minister Maurer offered only a weak pitch when he said that his department had “no Plan B” should the voters reject the procurement. The end result was that 53.4 percent of the Swiss voters who went to the polls [in May 2014—Ed.] cast a “no” vote on the question of whether to provide roughly CHF3.1 billion ($3.18 billion) in funding for the Gripen procurement. Thus, the Swiss effort to purchase the Gripen – despite having passed multiple political hurdles, including gaining approval in both houses of Parliament in September 2013 – proved abortive. Now the DDPS is circling back to the issue with an eye on building greater consensus toward future air defense alternatives through the recommendations of both the expert group and a concurrent support group made up of representatives of industry, the military, the foreign ministry, and a member of each major political party. The support group’s aim was to lay the groundwork for any future combat aircraft procurement, from the evaluation of types to consideration of the capabilities required and finally to the acquisition of a selected platform. Together these groups form a steering committee of sorts, with the support group in particular serving as a basis for the defense minister to chart a pathway forward. The expert group presented four options for consideration by the DDPS. The first – and most ambitious – envisions a high-cost scenario in which the entire fighter inventory is replaced by 55 to 70 new combat aircraft. This option also calls for the replacement of the Swiss military’s existing air defense network – consisting of FIM-92 Stinger light guided missile systems, MBDA Rapier mobile guided missiles, and Oerlikon 35mm GDF-001 twin anti-aircraft guns – in parallel with the fighter purchase, thus providing both ground- and air-based protective airspace solutions with improved capabilities in one broad sweep. But the price tag – estimated from CHF15 to CHF18 billion – likely comes in too high for public appetite and would undoubtedly result in another referendum with limited chances for approval. However, noting that the modernization of existing air defense assets must begin immediately, the expert group recommended using the defense budget as a means of making installment payments on any such order. While this would require significant bumps in annual defense allocations starting at the point of recommendation by the panel (the Army’s fiscal year 2022 budget), it does provide a deft means of sidestepping the popular referendum issue without setting up a special fund for the procurement as was done with the Gripen project. The second option calls for the acquisition of 40 new fighters and the procurement of a new air defense network, together bringing the cost to CHF9 billion. The third option recommends the acquisition of a still smaller number of new aircraft – 30 – plus extending the services lives of the F/A-18 Hornets out to 2030 and a substantial upgrade to the current air defense network. The cost estimate for this option came to CHF8-CHF8.5 billion. The fourth and final option presented the most cost-affordable option in the short term, calling for the purchase of 20 new fighters, a service life extension of the Hornet fleet, and the refurbishment of the Swiss Army’s current air defense network. This option is the least pricey at CHF5 billion, but also kicks the can farther down the road in terms of long-term requirements. Though the higher cost of modern fighters renders a broad unit-for-unit replacement of the Swiss Air Force combat fleet unlikely, a smaller-batch fighter purchase would still require the DDPS to come back and revisit Hornet replacement and future air defense network options in 10 years. In determining its preferred path forward, the DDPS has its work cut out for it, with the difficulties of navigating political and budgetary minefields and taking into account fighter capabilities and future force structure requirements intertwined in one knotty puzzle. In the end, expect option four to be pushed aside in favor of the third and second options. The first option, calling for the complete modernization and renewal of Swiss air defense capability, represents the ever-elusive brass ring and may struggle to receive Federal Council approval.